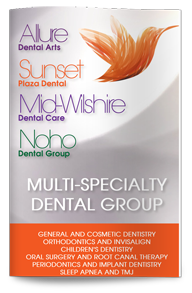 When a patient is looking to transform their teeth into a world-class smile, our West Hollywood cosmetic dentist is only a phone call away. Our dental office prides itself on providing all of the leading cosmetic dentistry services in a comfortable and welcoming atmosphere that will keep patients coming back time and time again. As the leading West Hollywood Lumineers expert, Dr. Ghasri will devote the time and energy that it takes to address your own personal needs and concerns from the moment that you walk in our doors. Lumineers are the most advanced form of porcelain veneers and offer some huge advantages over their counterparts. Traditional veneers are thin pieces of composite or porcelain that are applied to the teeth with a bonding agent. Unlike the services of our specialist for Lumineers in West Hollywood, this process often had to begin with the dentist shaving off a small amount of the teeth to make room for the veneers and making the surface slightly more rough for a better bond. Lumineers act in a very similar manner, but they have many advantages. Not only will our expert on Lumineers in West Hollywood be able to provide more durable and sturdy Lumineers, they are also much thinner. For our patients, this means that there is a very low likelihood that there will be any necessity to shave off a thin layer of the enamel, a process that cannot be reversed. It also decreases the chances that a patient will require any shots or other forms of anesthetic. Lumineers are a great option for those who would like a long-term solution to improve the appearance of their smile. Modern bonding agents often last 15 years or longer and can cover up almost any amount of gaps, chips, cracks, or severe discoloration. If you have been on the search for a West Hollywood Lumineers dentist to achieve the smile of your dreams, Dr. Ghasri is here for you. Our staff is proud to provide a full line of services in order to give you an amazing smile and impeccable oral health that will last a lifetime. Visit Lumineers.com for more information about Lumineers.